The United States District Court for the Southern District of Texas (in case citations, S.D. Tex.) is the Federal district court with jurisdiction over the southern part of Texas. The court's headquarters is in Houston, Texas and has six additional offices in the district. Appeals from cases brought in the Southern District of Texas are taken to the United States Court of Appeals for the Fifth Circuit (except for patent claims and claims against the U.S. government under the Tucker Act, which are appealed to the Federal Circuit). Ryan Patrick is the current United States Attorney since January 8, 2018. The oldest federal civil building in Texas, the 1861 Customs and Courthouse in Galveston, once housed the Southern District of Texas. Since its foundation, the Southern District of Texas has been served by forty-one District Judges and six Clerks of Court. The first federal judge in Texas was John C. Watrous, who was appointed on May 26, 1846, and had previously served as Attorney General of the Republic of Texas. He was assigned to hold court in Galveston, at the time, the largest city in the state. As seat of the Texas Judicial District, the Galveston court had jurisdiction over the whole state. On February 21, 1857, the state was divided into two districts, Eastern and Western, with Judge Watrous continuing in the Eastern district. Judge Watrous and Judge Thomas H. DuVal, of the Western District of Texas, left the state on the secession of Texas from the Union, the only two United States Judges not to resign their posts in states that seceded. When Texas was restored to the Union, Watrous and DuVal resumed their duties and served until 1870. Judge Amos Morrill served in the Eastern District of Texas from 1872 to 1884. He was succeeded by Chauncy B. Sabin (1884 to 1890) and David E. Bryant (1890 to 1902). In 1902, when the Southern District was created by Act of Congress, Judge Bryant continued to serve in the Eastern District of Texas. The Southern District of Texas started with one judge, Waller T. Burns, and a Clerk of Court, Christopher Dart, seated in Galveston. 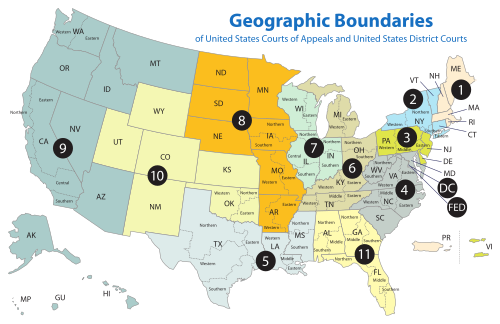 Since that time, the court has grown to nineteen district judgeships, six bankruptcy judgeships, fourteen magistrate judgeships, and over 200 deputy clerks. The U.S. federal building in Galveston, current home of the Galveston Division. The United States Courthouse is the current home of the Laredo Division. 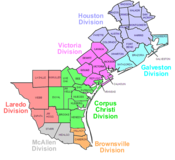 The Brownsville Division covers Cameron and Willacy Counties. The Corpus Christi Division covers Aransas, Bee, Brooks, Duval, Jim Wells, Kenedy, Kleberg, Live Oak, Nueces, and San Patricio Counties. The Galveston Division covers Brazoria, Chambers, Galveston, and Matagorda Counties. The Houston Division covers Austin, Brazos, Colorado, Fayette, Fort Bend, Grimes, Harris, Madison, Montgomery, San Jacinto, Walker, Waller, and Wharton Counties. The Laredo Division covers Jim Hogg, La Salle, McMullen, Webb, and Zapata Counties. The McAllen Division covers Hidalgo and Starr Counties. The Victoria Division covers Calhoun, DeWitt, Goliad, Jackson, Lavaca, Refugio, and Victoria Counties. 2 Joseph Chappell Hutcheson Jr. TX 1879–1973 1918–1931 — — Wilson appointment to 5th Cir. 7 Joe McDonald Ingraham TX 1903–1990 1954–1969 — — Eisenhower appointment to 5th Cir. 8 Reynaldo Guerra Garza TX 1915–2004 1961–1979 1974–1979 — Kennedy appointment to 5th Cir. 47 Gregg Costa TX 1972–present 2012–2014 — — Obama appointment to 5th Cir. ^ Resigned June 30, 2009 after being impeached. ^ "U.S. Department of Justice: 2002 Centennial Report, pgs. 1, 10" (PDF). Archived from the original (PDF) on June 1, 2009. Retrieved May 24, 2010. ^ a b "Southern District of Texas: History of the District". Archived from the original on September 17, 2009. Retrieved October 4, 2009. ^ "Galveston Historical Foundation: More About the Custom House". Archived from the original on February 20, 2009. Retrieved October 3, 2009. ^ a b Paschenko, Chris (April 27, 2012). "Senate confirms Costa for isle federal judgeship". Galveston County Daily News. Retrieved April 27, 2012. ^ Flood, Marry (February 23, 2009). "Judge Kent accepts plea deal and retires from bench". Retrieved February 23, 2009. ^ Rice, Harvey (July 9, 2009). "Kent's judgeship in Galveston moving to McAllen". Houston Chronicle. Archived from the original on July 22, 2009. Retrieved July 22, 2009. The Galveston federal courthouse where disgraced former U.S. District Judge Samuel Kent presided for 18 years will remain vacant and his replacement moved to McAllen, the chief judge of the Southern District said Thursday. [...] The decision to move the post from Galveston to McAllen was made because few cases are heard in Galveston while immigration and drug cases are swamping judges in courts near the border, Chief Judge Hayden Head said. ^ a b "Laredo". United States Department of Justice. Retrieved October 11, 2016. This article incorporates text from this source, which is in the public domain.